As you know, I am really into nature, being outdoors and active. Therefore it might not be surprising for you, that I am back at my roots. The last time I have been here was seven years ago. I am standing in Sankt Berta, the place I call home. 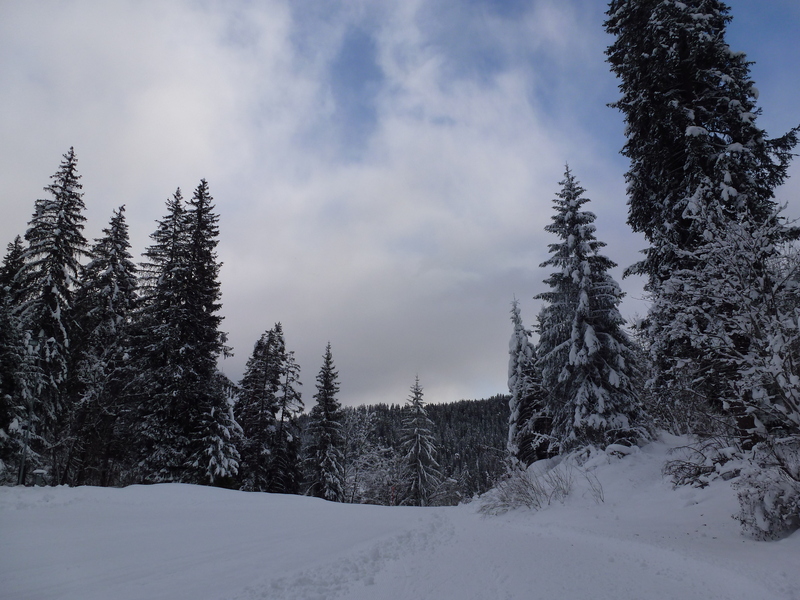 Around me, white slopes, pine trees and beautiful mountains. The air I am breathing in is fresh, pure and cold. The sun is out and I am trying to catch the last warm shafts of sunlight before I ski down. As I am skiing down, memories of how this place used to be come into my mind. A lot has changed over the past 35 years. Not only this place has developed but also the people have changed. Everyone is contributing to make this destination a better place for everyone. Even the tourists who are visiting Sankt Berta are different, they value the sustainable environment. People seem to be happier and more relaxed. Let me tell you, compared to 30 years ago this was a huge progress. There is one story I remember well, it was my farewell night and we had a few drinks after a nice day on the slopes. As we went out to have a smoke I told my friends: “The moment I touch Canadian ground, I will quit smoking!” Everyone started laughing, as nearly all of us were smokers and had been for years. I took the newspaper article out of my pocket and showed the news announcing ‘Whistler ski resort launches total smoking ban’. They laughed even harder: “You and quit smoking, never!” I was upset and so I threatened them that I would turn this place into a smoke free destination one day! On December the 1st in 2020 they finally stopped laughing when Sankt Berta was introduced as the first Swiss smoke free winter destination. Only three years after I returned from Whistler, I started working as a sustainable development assistant in the DMO of Sankt Berta. The smoke free winter destination was one of my first projects. I remember my former boss speaking in front of the press by the day of the opening: Especially due to the well accepted national non-smoking law (May 1st, 2010) and increased demand for smoke free public areas, it was possible for us to implement our project successfully. 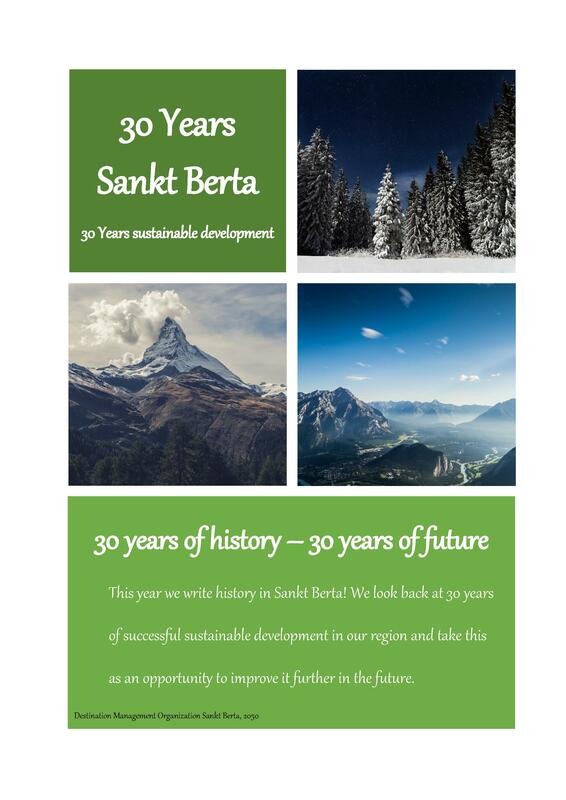 As I am walking through the resort, I can see the posters everywhere „30 Years Sankt Berta – towards a sustainable future“. Some of them indicate different stages of the sustainable development from the past 30 years. One in particular catches my attention immediately. It demonstrates the car free project, which started in 2030. Definitely one of the best ideas this region had but the story who caused it is tragic. 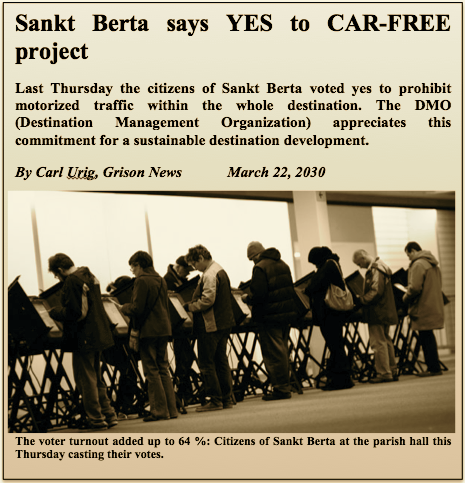 I still have the headlines in my mind: „Tragic car accident forces destination to rethink its transportation mode“; „Sankt Berta votes with an absolute majority for car free project“. By chance I run into Hannah, who was in charge of the project. She tells me that they had already been thinking of turning the resort car free, long before the dramatic accident. She tears up, so I don´t want to be intrusive, but then she starts talking about the project. The accident supported and only fastened the determination of a car free Sankt Berta. Hannah furthermore explains that Switzerland was among of the first to have car free resorts and destination and that the demand was increasing each year (Harneis, 2014). I remember the increasing trend as I was travelling the US. More and more destinations implemented car free zones in order to ensure security, reduce accidents caused by traffic and lower the CO2 emission to the minimum. These trends towards a more sustainable behaviour in all aspects of life was tremendously growing. The time I came back from my travels and started working for DMO of Sankt Berta again, was the peak of it all. Especially the people in smaller cities wanted to decrease their environmental footprint by reducing waste. In order to be ahead of the trend, we started the project zero waste resort. It became that big of a deal that we received an invitation from the International Tourism Exhibition in Berlin to introduce our „Business model for a sustainable destination“ in 2041 oriented on the 6 dimensions of sustainability, just one year after the launch. The zero waste project was just the third stage of four towards our goal of a sustainable destination and they were already interested! This was one of the most exciting experiences I have ever made. I was really nervous already to present our business model to a larger group of people, but then we were informed that the presentation was moved to a larger hall due to high interest. At the end I had to present in front of nearly 500 hundred people, all from different sectors of the tourism industry. It was incredible and I overcame my nervousness that day. Today I am used to speak in front of so many people, luckily. It is beginning to get darker as I am walking back to my lodge. The construction still overwhelms me every time I enter. The friendly receptionist reminds me that the e-shuttle will be ready in half an hour to take me to the event, so I need to get ready. I am really excited about the future projects they will be talking about tonight. Hannah told me earlier today that in the memory of the past 30 years of Sankt Berta, they will introduce future projects and visions for the next 30 years. I am making my way to the new guildhall. This destination really has changed a lot over these years. Smoke-free, car-free and waste free is nearly at the end of its implementation. So there is basically only the last stage left. I am wondering if tonight’s event will reveal the progress of demountable buildings. I just read recently an article that pointed out the research back in 2013 (Bavay et al.) about the snow coverage and runoff in larger mountain areas in this region revealed significant findings. It was said that over the next decades up to 2050, rather small changes were predicted. 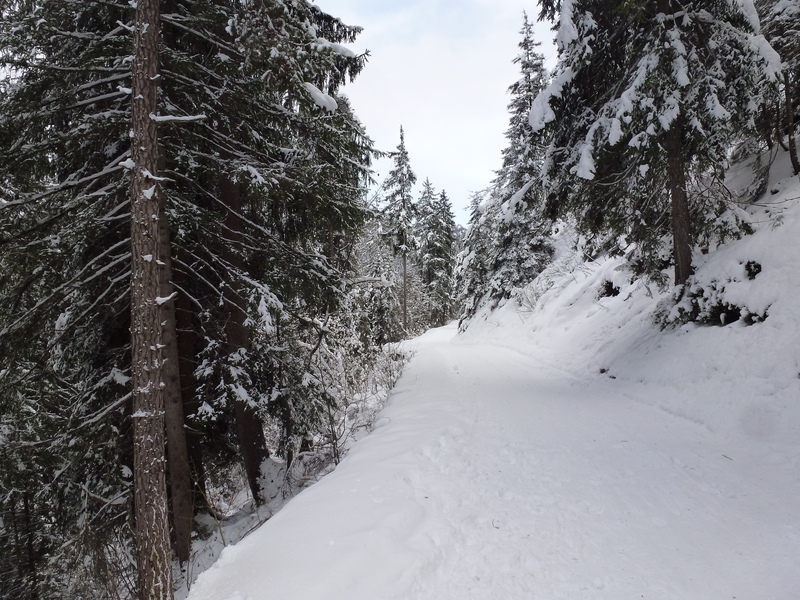 The more serious changes are expected in the second half of the century, resulting in a shortage of the winter season from five to nine weeks due to the reduction of snow. And as we all know until this point they were right. Seasons have already changed and shortened. It seems that even the major of St. Berta has read the article as he refers to in his speech. „The importance of this change is enormous for us as a destination and we need to be innovative, motivated and confident towards our future! I am happy to announce that projects are already running and you are all part of it. Tonight we inaugurated the new guildhall, which is part of one very special project. This building was designed to represent the first milestone of our vision of temporary reconstruction.“ Major Ospelt pauses and waits for the reaction of the audience. I’m looking around and everyone in the hall is astonished and claps enthusiastically. You can clearly see a feeling of relief in his face as he continues with his speech. Oh my god! I did not see this one coming. Remember I told you I was good in speaking in front of a large audience, well, I am not so good in taking compliments. Oh no, now he even waves me to the stage. That’s my call guys, until the next time.